Although the first Amish arrived in America in the mid 1700s, the European Anabaptist movement began well before that, in 1525, as a radical wing of the Protestant Reformation. Anabaptists differed from other Christians most significantly in two things: they practiced adult baptism, which went against the beliefs of Catholics and other Protestants at the time, and they insisted on a "free Church" separate from state interference. In the late 1600s, Anabaptist leader Jacob Ammann and his followers promoted "shunning" and other religious innovations, which ultimately led to a split among the Swiss Anabaptists into Mennonite and Amish branches in 1693. The population of North American Amish grew slowly in the 18th- and 19th-centuries. They began thriving after the middle of the 20th century, and today their population has swelled to more than a quarter of a million people in nearly 2,000 church districts. While each church community follows its own unique lifestyle guidelines, all Amish groups have an Ordnung -- a set of unwritten behavioral regulations that members must follow. These rules vary by church district but they usually limit and ban certain technologies, and restrict interaction with the outside world. Baptism into the Amish church is not only a commitment to the faith but also a commitment to uphold the Ordnung. William Penn arrives in America on the ship Welcome and founds Pennsylvania. 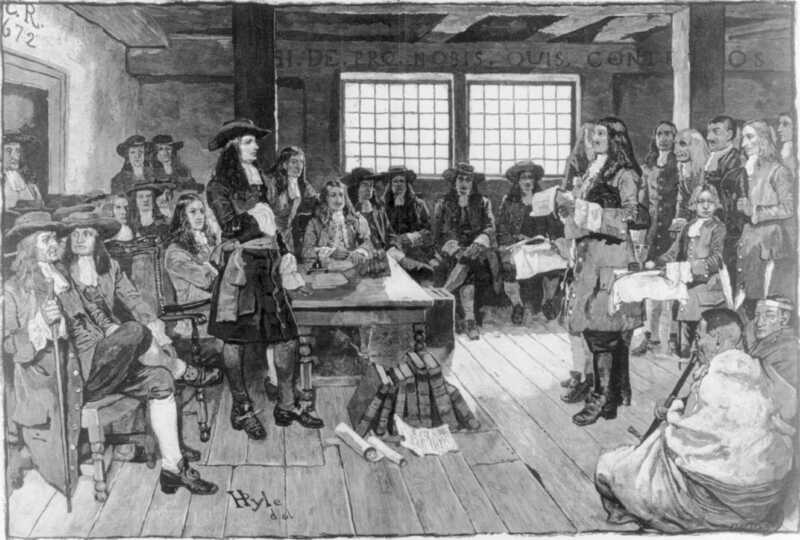 A Quaker, Penn promotes religious freedom in the colony that he creates as his "holy experiment." Pennsylvania will become a refuge for both Native Americans and people of various religious denominations who are being persecuted elsewhere. Thirteen German Mennonite families arrive in Pennsylvania seeking religious freedom. They found Germantown six miles north of Philadelphia. The Charming Nancy sets sail for North America from the Netherlands with 21 Amish families. Over the next three decades, about 100 families will make the crossing. Jacob Hertzler, the first well-known Amish bishop in North America settles in Northkill Creek, in Berks County north of Philadelphia, Pennsylvania. Over the next 50 years, 3,000 Amish will immigrate to North America from Europe. Amish begin settling in eastern Ohio, farming side by side with the Native Americans already there. Twenty five years later, this community will consist of approximately 250 Amish families. Communities in Pennsylvania and around the country establish one-room public schools, which typically run through the eighth grade with one teacher for all students. In many areas, Amish and English children attend the same schools and leave around age 14 to work on their family farms. Amid Amish settlements, various churches debate over dress code, separation from society, and use of technology such as photography. The intensifying debates culminate in the first all-church Amish ministers' conference in Wayne County, Ohio (Diener-Versammlung), which will occur almost annually until 1878. The more conservative Amish depart this year's Diener-Versammlung dissatisfied and trigger a gradual but major division within Amish communities in North America. For the first time, the more conservative flank becomes known as "Old Order" Amish because they cling to the Old Ordnung. The more progressive Amish become Amish-Mennonites, and slowly over several decades become assimilated into Mennonite churches. The Egly Amish form under Bishop Henry Egly from Adams County, Indiana. Egly mixes evangelical sentiments with the beliefs of the Amish, promoting personal conversion, and takes a more personal authority over the congregation. The Stuckey Amish form under bishop Joseph Stuckey from McLean County, Illinois. They allow excommunicated members from other communities to join, are more relaxed in their restrictions, and believe God will save all of humanity regardless of religious affiliation. The telephone is invented by Alexander Graham Bell. The Bell Telephone Company will be founded a year later. About 1.4 million telephones are in service across the country, including some in Amish homes. "Party lines" are shared by multiple families, and several Amish groups begin debating the dangers that home telephones present to the community. At this time, the Amish population in America numbers around 6,000 and over the next 30 years it will more than double. While still concentrated in Pennsylvania and the Midwest, new Amish settlements are growing in Kansas, Ohio, Michigan, Iowa, Oklahoma and Delaware. Henry Ford's Model T car debuts, and will rapidly gain popularity in the coming years. About 20 percent of the Old Order church in Lancaster, Pennsylvania break away and form a new Peachey group, which will later join the Beachy Amish. 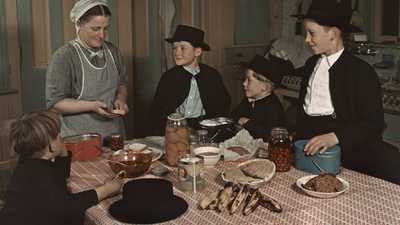 The new Amish group does not agree with the Old Order's ban on telephones in the home and the strict shunning policy. Old Order Amish communities across North America decide, over several years, to forbid telephones in their homes, although using a public telephone is permitted. They also gradually begin to ban the ownership of automobiles, citing the risk that car ownership would encourage urban contacts and pull their community apart. Most Amish can still ride in a car as passengers under certain circumstances, but they may not own or drive one. 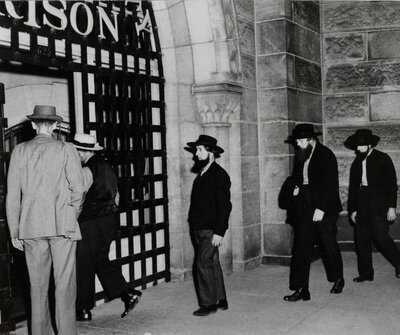 The U.S. begins a national conscription service; some Amish boys receive exemptions for farm deferments as conscientious objectors, but others are required to report to Army camps. Drafted Amish who refuse to enter armed service are sent to the Army camps for non-combatant service and are often subjected to abuse. Some members of the Amish community express concern over Amish boys being pulled away from the church and not returning to their home communities following their service. World War I ends. There is no record of any Amish casualty. Over the next 10 years Amish communities ban connection to the electrical grid. However, they continue to use electricity from batteries, which was never forbidden. By this time, the Old Order Amish population in North America is nearly 10,000. Ohio's Bing Act mandates that children through age 18 attend school. Old Order Amish resist this new law because they believe children only need basic scholastic knowledge, reading, writing, and math, and should learn their values and morals at home. Several Amish parents keep their older children out of school, prompting arrests, fines and jail sentences. Five Amish fathers are arrested in Holmes and Wayne counties of Ohio for disregarding the Bing Act by keeping their teenagers at home. Over the next 20 years, Old Order Amish communities ban the use of tractors and other self-propelled farm equipment in fields. New technology and equipment may be used in the field if it is pulled by horses or mules. The state of Pennsylvania begins to consolidate its public school system, closing down many one-room Amish schoolhouses. Around this time, the Beachy Amish begin buying and driving their own automobiles. Crossing this cultural boundary excludes them from the horse-and-buggy driving Amish. This division will soon solidify the use of horse-drawn transportation as a key aspect of Amish identity. Amish leaders in some groups begin allowing telephone shanties in community areas for emergencies. Several Amish communities establish local private schools so their children will not have to attend public school. The Social Security Act passes to help limit the risks of modern life for Americans in retirement or illness. At this time the act does not include farmers, and the Amish community remains largely unaffected. The Pennsylvania State legislature's plan to close 10 one-room schools and replace them with a consolidated elementary building sparks outrage among the Amish community in the East Lampeter Township near Lancaster. This same year, the legislature lengthens the school year by one month (to nine months) and raises the age of compulsory attendance by a year (to 15.) Amish students typically left school at age 14 to do farm work. Sixteen Amish delegates, preachers and laymen form the Delegation for Common Sense Schooling and write a petition to regain control over the education of their children. They collect more than 3,000 signatures from mostly "English" people in surrounding communities who support their cause. Pennsylvania State Legislators pass a measure allowing 14-year-olds to leave school for farm and domestic work. 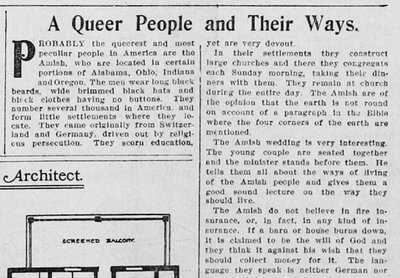 Around this time, the Amish open their first two private schools in this state. 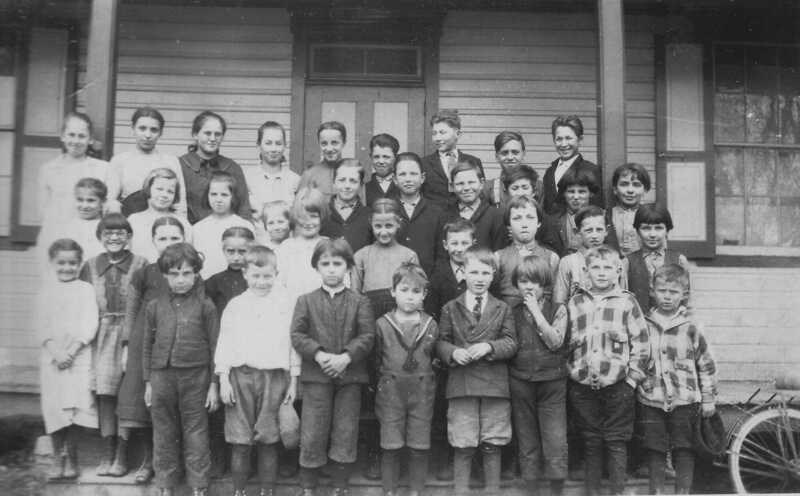 Several Old Order households move from Lancaster County to a new settlement in Saint Mary's County, Maryland because of conflicts over Pennsylvania's school attendance laws. There are about 21,000 Amish living in North America. The U.S. and Canadian governments accept alternative service options for conscientious objectors (CO's): the American Civilian Public Service (CPS) and the Canadian Alternative Service Work (ASW) allow Amish draftees to work non-military assignments and stay in special CO camps. They will provide free labor in forestry projects, hospitals, social work and on farms. Many also receive farm deferments and may work at home because agricultural production supports the national interest during war. The U.S. enters World War II after the Japanese attack Pearl Harbor and begins military conscription. About 772 Old Order Amish men are drafted, and all of them declare themselves CO's. The war in Europe ends. The war in the Pacific ends. With the beginning of the Cold War, President Truman reinstates the military draft, with the goal of establishing a large peacetime standing army. The draft completely exempts CO's. The Korean War begins. With the U.S. military entering combat, the draft system no longer exempts Conscientious Objectors. Amish men can enter some type of alternative service as part of the I-W program where CO's spend two years working in government or non-profit organizations that benefit society; most of these organizations exist outside of the men's home communities. A renewed version of the Social Security Act protects every working American, including Amish self-employed farmers and other workers. The Amish view Social Security as a form of insurance, and decide they will not receive the benefits; they send a petition with 14,000 signatures asking to be released from the tax. 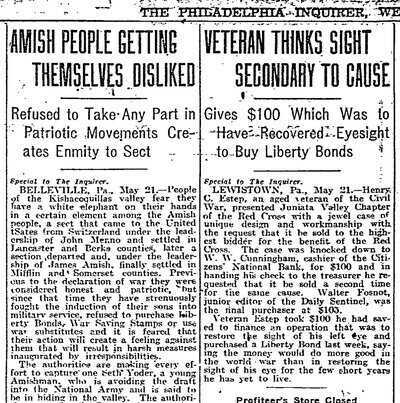 In 1958, after some Amish refuse to pay Social Security, the IRS begins to confiscate property. Because hundreds of Amish fathers are imprisoned for refusing to send their children to high school, Pennsylvania agrees to a new "vocational school" option for the Amish. Children attend school through eighth grade, after which they can work at home and go to an Amish vocational class once a week until they are 15. This plan will be copied in other Amish regions across the country. The Vietnam War begins. The U.S. will be involved primarily as advisors until 1964. The Amish open their first vocational class in an Amish home. Attendance records are still reported to the state, but students are under the vocational guidance of their parents for most of the week. In Buchanan County, Iowa, an Amish community reopens its one-room schoolhouses and hires its own Amish teachers. Locals promise to take action against these schools. President Lyndon B. Johnson commits American combat troops to the War in Vietnam. 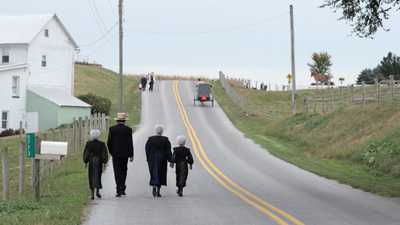 The U.S. Congress exempts the Amish from participating in Social Security. The Amish believe they do not need Social Security because it is the duty of church members to care for each other's material needs. Today, Amish families fill out IRS Form 4029 after a child is born to exempt them from Social Security; they do not pay into it or receive payments from it. Authorities attempt to close Buchanan County, Iowa's Amish schoolhouses by force. The operation gains national attention and public sympathy grows for the Amish cause. Governor Harold E. Hughes asks the state legislature to address this situation. As schooling conflicts erupt in more states around the U.S., non-Amish lawyers, academics, and religious leaders form the National Committee for Amish Religious Freedom. The group advocates on behalf of the Amish to defend and preserve their religious freedom. In Iowa, the General Assembly agrees to exempt any Amish who have been in the state for at least 10 years from certain public school requirements. The Amish can manage their own schools with their own teachers. The Old Order Amish Steering Committee emerges in response to concerns over the negative impact of Selective Service policies on draft-age Amish boys. The Korean War's I-W program is still in place, but the Amish are worried because it regularly places young Amish men in the outside world for two years, and some never return home. The Committee lobbies government officials for changes in alternative service policies for Amish CO's. The Steering Committee and the Selective Service (military draft) finalize an agreement to let young men serve their I-W alternative service on Amish-owned farms instead of outside non-profit organizations when drafted. Amish CO's may now serve two years on farms leased by the Amish church, thereby keeping them within the church fold and removing the temptations of the modern world. The North American Amish population surpasses 50,000 and will hereafter double every 19 to 20 years. The National Committee for Amish Religious Freedom opens a lawsuit, Wisconsin v. Yoder, demanding that the Amish be exempted from the state's schooling codes. 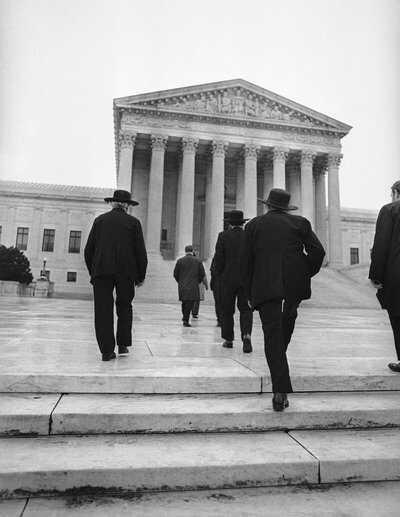 The case goes to the U.S. Supreme Court, which ultimately sides with the Amish, allowing them to withdraw their children from schools (private or public) after the 8th grade. Ten years after the Wisconsin v. Yoder decision, Nebraska will still not allow the Amish to use uncertified (Amish) teachers for their children. Deciding against taking further court action, many Amish leave the state for Ohio and Pennsylvania. There are about 123,000 Amish living in North America. An Amish community in Nickel Mines, Pennsylvania receives international attention when Charles Carl Roberts IV shoots 10 Amish schoolgirls, killing five of them before taking his own life. Reaching out to the assailant's widow and parents a few hours after the incident, Amish people forgive Roberts and extend grace to his family, earning widespread recognition as a forgiving community. Amish settlements are now scattered as far west as Colorado, south to Texas and northeast into Maine. At this time, 28 states as well as the Canadian providence of Ontario have Amish communities. Most migrating Amish are searching for inexpensive land and/or fleeing encroaching urban sprawls. Pennsylvania, Ohio and Indiana still host almost two thirds of America's Amish population, which now totals around 261,000. An English (non-Amish) man observes another man walking down the street — he is in plain dress, he wears suspenders and a hat. He must be Amish... right? Internationally renowned scholar Donald B. Kraybill to answer our top ten questions about the Amish. Among the Amish, "Rules of a Godly Life" are considered more of an annex to the Bible — an inspirational book to help guide the way to a more fulfilling life.